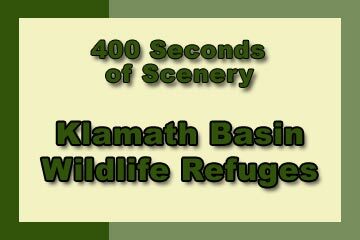 Wildlife Refuges of the Klamath Basin - Explore! 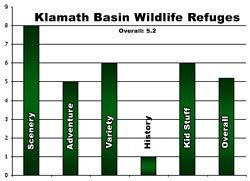 Wildlife Refuges of the Klamath Basin - Explore! Like many places around the world, wetlands in the Upper Klamath Basin were drained to provide croplands for a hungry nation. Here, the United States Bureau of Reclamation began the process in 1905 with an effort called the Klamath Reclamation Project. The needs of waterfowl were recognized early on with the establishment of the first waterfowl refuge in the United States, the Lower Klamath Refuge, in 1908. Five more refuges followed. The reasons for these refuges are simple. Around 75% of the birds that use the Pacific Flyway come through the Klamath Basin every fall and spring. They need a place to feed and regroup at this point in their travels. 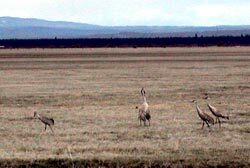 The birds have used the Upper Klamath Basin as a stop over point for millennia and refuges were needed to insure that the necessary habitat would continue to be available to them. We will be exploring each of the refuges, but wanted to offer you a quick overview of the refuge system and what it has to offer. The location map provided by the U.S. Fish and Wildlife Service, below, provides a great orientation. If you are coming from outside the area, there is Amtrak service to Klamath Falls, Oregon. You will need a car or guide service to get to the refuges as there is no public transportation to these locations. 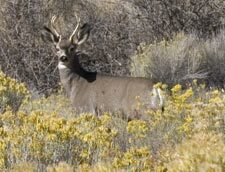 If you are unfamiliar with these wildlife refuges, you will want to stop at the Headquarters and Visitor Center first. It’s on Hill Road, five miles west of the community of Tulelake, California, USA. You will find some great wildlife exhibits and lots of information at the visitor Center. It is open from 8:00 am to 4:30 pm weekdays and 9:00 am to 4:00 pm on weekends and holidays. It is closed on Christmas and New Year’s Day. The visitor center is within the Tule Lake National Wildlife Refuge. Each of the refuges offer somewhat different habitats. The Lower Klamath Refuge offers small areas of open water amidst its 30,000 acres of marsh lands. The refuge is managed in cooperation with local farmers to insure a supply of food for visiting waterfowl. Accordingly, 15,000 acres of the refuge are managed for crops. For human visitors, the refuge offers several viewpoints along Stateline Road (Highway 161) and a 10 mile long auto tour route that winds through the marsh lands on gravel roads. Generally you will get the best view of the wildlife from your car. The animals move away quickly when a car door is opened. Hunters can access the refuge by boat or field hunt for geese and pheasant in the areas where crops are grown. Hunters must be licensed by the proper states and follow all state hunting regulations.The refuge also offers a couple of blinds that you can reserve for waterfowl and raptor photography. The Tule Lake Refuge is characterized by a large body of open water surrounded by marsh lands and crop lands. Around 19,000 acres of the refuge are used by local farmers to produce alfalfa, potatoes, grain and other crops. These crops and the waste left after harvest provide food for the thousands of birds and other animals that move through the area each year. Around 8,000 acres of uplands offer habitat for animals like deer that easily move to the water and croplands of the refuge. Refuge management involves a unique program called “Walking Wetlands.” Under this program, the areas that are flooded and those that are farmed vary from year to year. Farmers find that after four years of flooding, the fields show yield increases of around 25%. At the same time, the program increases the amount and variety of wetland habitats and has brought increasing numbers of birds to the refuge. For visitors, the refuge offers the Discovery Marsh Nature Trail, just across Hill Road from the visitor center. The trail is about 1 mile long and offers several interpretive panels and two kiosks. Also at the visitor center, you can find the Sheepy Ridge Wildlife Trail. This short, but steep, trail leads to a lookout from which you can see the entire refuge. Along the way are several numbered posts that correspond to information in the free brochure that is available at the trail head. It’s a great trail for swallows (that move to the San Juan Capistrano Mission each winter) and raptors. An auto tour of the refuge begins five miles south of the visitor center. Pick up a guide at the entrance and use it to help you identify the many bird species you will see. The refuge also offers a canoe trail (July thorough September only) and photo blinds that you can reserve. The Upper Klamath Refuge is on the western shore of Upper Klamath Lake. Its 15,000 acres are a combination of marsh and open water. Typically it has more open water than the Lower Klamath Refuge and less than the Tule Lake Refuge. Since it doesn’t have roads around and through it, the best option for viewing wildlife is the year-around canoe trail. The canoe trail is marked and is almost 10 miles long. It traverses Crystal Creek and Recreation Creek, two crystal clear streams that flow from springs fed by snow melt from the east side of the Cascade Mountains. You are likely to see muskrat, beaver, river otter and some very large trout as well as a huge array of bird species. This refuge has almost no marsh habitat. It’s 20,000 acres of open water (which varies depending upon precipitation) is surrounded by 26,000 acres of grassland. There are rocky islands within the lake that provide perfect habitat for colonial nesting birds like American white pelican and double-crested cormorant. In fact, this is one of only two white pelican colonies remaining in California. Typically, 1,400 pelicans are fledged in the refuge each year. Visitor use is very limited. First, access is poor and often four-wheel drive vehicles are needed to get near the refuge. Second, the refuge is closed to public use except for limited goose and antelope hunting (10 permits for a two-week season each year) on the western shore. No boats are allowed. Bear Valley Refuge is the newest Klamath Basin Refuge, established in 1978. Unlike the other refuges where the primary focus is waterfowl, here the focus is bald eagles. The 4,200 acre refuge is all uplands covered with old growth pine and fir forests. Several pairs of bald eagles nest here and as many as 300 have been counted roosting here in one night. The refuge itself is closed to public access except for a short deer hunting season. The eagles, however, are seen every morning from December to March as they fly out of the Bear Valley Refuge to the other refuges where they dine on waterfowl. The eating is so good for eagles that they congregate here from as far away as Glacier National Park and the Northwest Territories. This refuge is located on a hillside west of U.S. 97 near Worden, Oregon. As a group, these refuges offer world class birding opportunities. That adds to the variety and scenery as does the combination of farmlands, water, marshes and forests that make up these refuges. Some of the scenery, particularly the views of the Cascade Mountains from the Klamath Marsh Refuge, the views of Klamath Lake from above the Upper Klamath Refuge, and the views of Mount Shasta from the Lower Klamath Refuge are quite stunning. Other than the founding of the refuges and the Civilian Conservation Corps lookout at the Tule Lake Refuge, the history of the area is not interpreted for the visitor. Kids will enjoy the nature trails, and if you can do it, the canoe trails. These aren’t particularly adventuresome places to visit although getting to the Clear Lake Refuge will be a significant adventure to some people. Overall I rated this adventure a 5.2 on our scale of 1 to 10. If you have been to these refuges, feel free to add your comments below. The photos and text in this article are by Jerry Haugen, Pathfinder, and are ©2010 Global Creations LLC, All Rights Reserved. The video is by Anders Tomlinson and was produced by the U.S. Fish and Wildlife Service. You can also see this video at the refuge headquarters near Tulelake, California. The location map was provided by the U.S. Fish and Wildlife Service.